Killer Sausage: There's An App For That (!?) - This Phrase Takes A Whole New Meaning With SIRI On The iPhone 4S! There's An App For That (!?) 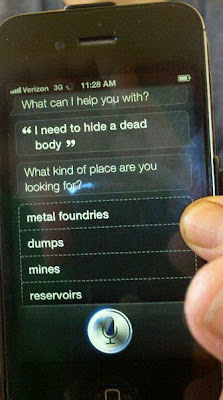 - This Phrase Takes A Whole New Meaning With SIRI On The iPhone 4S! My brother's new iPhone 4S is equipped with the new SIRI app that allows users to ask any (and i mean any) question you want in plain language and retrieve an answer almost immediately. We tried a lot of questions, but this one is so apt for the upcoming Halloween season I had to post this picture. SIRI is very thorough and detailed in her answers. If you have one of these iPhone's ask SIRI "Do you use Windows?" for a good laugh and fitting tribute to Steve Jobs. Tony Soprano would be very proud of Steve Jobs. Photo: ©2011 Brendan Wayne and David La Cava. All Rights Reserved. SIRI, iPhone, the iPhone screen and user interface are all property, patented materials and trademarks of Apple, Inc. All Rights Reserved. Not responsible for third-party content. The more comments the spicier the sausage! Killer Sausage App! Scan The Barcode And Have Your Killer Sauage To Go!! Cozy's Is Dead, Long Live The Local Peasant! Get the Killer Sausage widget and many other great free widgets at Widgetbox! All content including but not limited to video, photography, written material and copy in this blog is the copyright of David La Cava unless otherwise stated. No claims, indemnifications or claims of copyrights are made to content provided through third parties or linked or embedded from third parties nor is David La Cava responsible for any said content. © David La Cava. All Rights Reserved. Picture Window theme. Powered by Blogger.